LeRoy Iseminger is a retired Lutheran minister who grew up on a farm in South Dakota. He has given much thought to his life and the land he was raised on and the passage of time; and he thinks about all this in the context of his faith. The South Dakota prairie he was from used to provide a home for one family to every 160 acres, but in just couple generations everything has changed. The land is still all farmed, but it is no longer lived on. 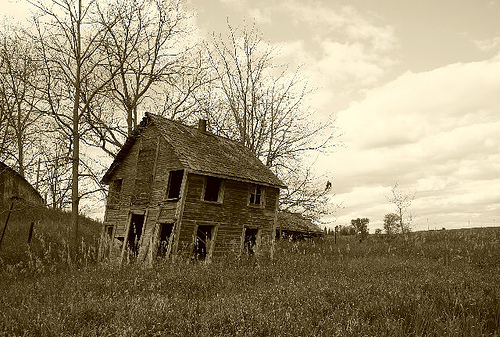 LeRoy’s home place, like most other home places in the great plains states, is now abandoned. He wrote an article about a visit he made to the old home place. Today’s meditation is from that article (paraphrased). All that remains of that homestead and that dream is the hog house that my father built. That’s still there, though not for long. The old wooden windmill has already crumpled into the prairie sod. That once proud tower that had pumped life into a prairie farmer, his family, and his livestock, is rotting in the dirt. The house that was a home for my father’s wife and their two little sons– that is gone too.